THE JUSTICE LEAGUETM: THE WORLDS GREATEST SUPER HEROES. Fueled by his restored faith in humanity and inspired by Supermans selfless act, Bruce Wayne enlists the help of his newfound ally, Diana Prince, to face an even greater enemy. Together, Batman and Wonder Woman work quickly to find and recruit a team of metahumans to stand against this newly awakened threat. But despite the formation of this unprecedented league of heroesBatman, Wonder Woman, Aquaman, Cyborg and The Flashit may already be too late to save the planet from an assault of catastrophic proportions. Exclusively designed by Canadian comic book artist Jason Fabok, the original art on the reverse features an inspiring image of the Justice League members standing tall together, as a united front protecting humanity against evil. The six members include: Batman in his black-and-grey uniform; the half-human, half-machine Cyborg; Wonder Woman, the Princess of the Amazons; The Flash, the Scarlet Speedster; the trident-wielding Aquaman; and the near-universal icon himself, Superman. Canadian colorist Brad Anderson has re-created the iconic colours of their costumes, which are heightened by the laser-engraved shattered glass background. AN ENDURING WORK OF ART: The reverse features original art by Canadian artist Jason Fabok. One of the industrys fast-rising stars, Fabok created this concept EXCLUSIVELY for this coinyou wont find it anywhere else. ALL-STAR TEAM-UP BEHIND THE SCENES TOO: The vibrant hues are the work of Canadian Brad Anderson, a prolific colorist whose credits also include the cover Action Comics #1 (2011), which was re-created on our 2015 Iconic SupermanTM Comic Book Covers series. BEAUTIFULLY CRAFTED IN 2 OZ. 99.99% PURE SILVER, your coin is a shining testament to the world-class craftsmanship of the Royal Canadian Mint! It truly shines, thanks to a mix of colour and engraving techniquesincluding the laser-engraved background that was first introduced on our Batman v Superman: Dawn of JusticeTM coins. NOT JUST A BOX: Your encapsulated coin is beautifully packaged in a custom case that has been specifically designed to showcase great Canadian art! Composition: 99.99% pure silver. Artist: Jason Fabok and Brad Anderson. Packaging: Premium graphic beauty box. Finished size: 84.5 mm x 84.5 mm. LAUNCH DATE: October 27, 2017. ADVERTISING DATE: October 13, 2017. Sale restricted to Canada, United States, Austria, Australia, China, Czech Republic, Germany, Hong Kong, Japan, Netherlands, Poland, Singapore, Thailand and United Kingdom. 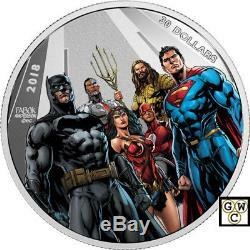 The item "2018 $30Fine Silver Coin-Justice League(TM) World's Greatest Super Heroes(18287)" is in sale since Monday, May 14, 2018. This item is in the category "Coins & Paper Money\Coins\ Canada\Commemorative". The seller is "gatewestcoins" and is located in Winnipeg, Manitoba. This item can be shipped to Canada, United States.